Nurture your mind and study Forex for free! Know everything about Forex, from the basics up to trading itself! Don’t worry, you won’t get lost in the explanation. This has its own curriculum from pre-school to college. Amazing isn’t it? Also, get updated with financial events by checking out their blog for economic updates. If you have any question, fire away and discuss it in their forum. Make your free time productive by checking out this Hot Website! Got the juice for travel? Here’s one site that could serve as a tool in satisfying your travelling needs. Couchsurfing gives you the best venue for an exciting and unique travelling experience. Couchsurfing is a worldwide network for making connections for the travelers and the local community they visit. So how does it work? The main idea with couchsurfing is to first find a place where you want to travel. Then, just log in to their website and search for people who could be your host. This could litterally mean that your host would give you a “couch” to stay on for the rest of your vacation, or book a hotel yourself if this would make you uncomfortable. The host will then tour you around. The itenerary depends. If you’re clueless or too lazy to research about hotspots around the place, then you could let your host do that for you. Or you could ask your host to take you to places you want to go. It’s also a social community wherein you could get to meet new people and chat with them. In each location you would want to go, you could get to meet great people and have a much more wonderful experience being a part of the culture of the place you visited. This also goes true when people want to contact you and visit you. You get to be the host, and spread the Philippine culture. You get to be an ambassador of the Philippines. Having said this, I’d said it’s considered as one of my Hot Websites! Good morning Gossip Girl fans! If you’re dying to see the latest episodes of television’s hottest show Gossip Girl, you may want to view it for free. Click here for an updated gossip experience. This website also includes a synopsis of every episode. So if you have no time to watch, just read. It would only take a minuite – but believe me after you do, you would want to hit that “click me” button. Do you have a secret so dark, so deep, that it’s already trying killing you… A secret you’ve been trying too keep so big, so intense, that the more you keep it the more it destroys you. 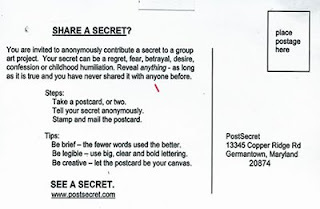 PostSecret discloses itimate secrets by sending postcards to the blogger for all the world to know. Nobody has to know it’s you. So do you want to tell a secret? Or would you want to discover one? Create your 4-by-6-inch postcards out of any mailable material. If you want to share two or more secrets, use multiple postcards. Put your complete secret and image on one side of the postcard. I know you couldn’t just send it easily via e-mail so you should do the old school snail mail this time. Don’t worry thought it will be fun to try. I’m telling you this is good stuff. Enjoy! It gets boring sometimes having your eyes all day long on the computer when you’re working. It’s pretty tiring now having to visit the same web sites you do everytime you open your computer. Well if you’re like me then it’s time to explore! There might be cool websites out there that we don’t know exist. So if you’re drained from working, or if you’re waiting for something to upload or for your reports to run, then take a break and check out the web sites that I will feature in my blog. Let me share with you the Hottest Web Places. I will post new entries every week and I will try to post and review websites that are unique and worthy of my entry every week. Please do comment if you want me to share your websites.